We can survive longer without food than we can without sleep. About twice as long. Good food may be central to good health, but so is good sleep. And we often miss out on its amazing benefits. Improved sleep has been linked to improved health in many ways. The evidence is clear that those who get plenty of sleep have a lower risk of being overweight, of being depressed, of being sick, of being injured, and that kids have better attention, better mood, better behavior, better grades, better standardized test scores – and a better quality of life overall. How did we let this slip away? 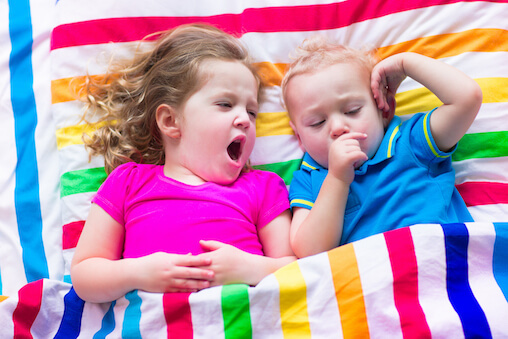 In the not-too-distant past, the phrase “sleep like a baby,” meant to sleep soundly and restfully all night long, not waking up even if there were a loud noise. Today “sleep like a baby” means to keep your parents in a state of constant exhaustion, teasing them by finally falling asleep and then waking up crying just when they set you down, or a few hours later. Rinse and repeat. For most of human history (and today if you go camping) the light of the sun set our sleep rhythms. During the day, our bodies would make vitamin D. After the sun set our melatonin levels would rise, carrying us off to a deep and restful sleep. It was easy. But by 1925 half of the homes in the United States had electric lights. These lights disrupted our sleep without our noticing. And now electric lights are not just in every room of our homes, but screen light is in our hands and in our eyes far into the night. It wasn’t until 2002 that mammals were found to have a third kind of photoreceptor in the back of the eye – not just the rods and cones we heard about in high school science class. These “new” retinal ganglion cell photoreceptors don’t yet have a catchy name (perhaps, “blues”? ), but they are sensors that use a pigment called melanopsin to invisibly monitor levels of blue light and cue our bodies to drift off to sleep naturally some time after the sun sets. The blue wavelength of light in most electric bulbs and screens powerfully suppresses melatonin and can delay and disorganize sleep causing sleep blues or blue light syndrome. I predict that by 2025, more than half of our homes and schools and hospitals will be designed with smart lighting wavelengths that mimic the rising and setting of the sun. And we’ll sleep better again without effort. But you and I don’t need to wait until then for our families to beat sleep blues. We can already minimize exposure to blue light wavelengths between sunset and sunrise today. Candlelight is a romantic and effective choice – but careful with the open flame. I like enclosing candles in hurricane glass. And some OLED candles work very well at skipping blue light. Lighting Science makes great nightlights for babies and beautiful smart lights for the home or dorm that follow the sun. Whatever you prefer, use dimmer switchers and smart choices to keep the overall intensity at the lowest level that sets the right mood. But what about those ubiquitous screens? Apple’s Night Shift feature or apps like f.lux or Twilight can pull key wavelengths out of your screens (though I don’t love the drab color, it’s worth it to me). Blue blocking sunglasses or filters could do the trick as well. Again, whatever your choice, turning down the brightness is your (and your battery’s) friend. Even better, turn off the screens at least an hour before bed. Good sleep is a great gift to yourself and those you love. We eat, we sleep, we live. Bon appetit! Bon sommeil! Bonne vie! Note: Dr. Greene is Pediatric Advisor to Lighting Science. Chang, A.-M. et al., 2014. Evening use of light-emitting eReaders negatively affects sleep, circadian timing, and next-morning alertness. Proceedings of the National Academy of Sciences, 112(4), p.201418490. Available at: http://www.pnas.org/content/112/4/1232.abstract. Conference, C. et al., 2015. SLEEP – Recommended Amount of Sleep for a Healthy Adult: A Joint Consensus Statement of the American Academy of Sleep Medicine and Sleep Research Society. , 11(6), pp.591–592. Available at: http://journalsleep.org/ViewAbstract.aspx?pid=30027. Kimberly, B. & James R., P., 2009. Amber Lenses To Block Blue Light and Improve Sleep: a Randomized Trial. Chronobiology International, 26(8), pp.1602–1612. Available at: http://www.tandfonline.com/doi/full/10.3109/07420520903523719. Lupi, D. et al., 2008. The acute light-induction of sleep is mediated by OPN4-based photoreception. Nature neuroscience, 11(9), pp.1068–1073. Available at: http://www.ncbi.nlm.nih.gov/pubmed/19160505\nhttp://www.ncbi.nlm.nih.gov/pubmed/18711396. Paruthi S. et al., 2016. Recommended amount of sleep for pediatric populations: a consensus statement of the American Academy of Sleep Medicine. Journal of Clinical Sleep Medicine, 12(6), pp.785-786. Statement, P., 2014. School Start Times for Adolescents. Pediatrics, 134(3), pp.642–649. Available at: http://pediatrics.aappublications.org/cgi/doi/10.1542/peds.2014-1697.